With the new renovations complete, golfers from everywhere are raving about the changes at Cherry Valley Golf Course in Stroudsburg, Pennsylvania. A change in the layout adds a twist to things. Come enjoy 3 new holes, cart paths on all 18 holes, new trees, traps and rebuilt tees (which will lengthen the course) and overall improved course conditions. Cherry Valley is still one of the most scenic golf courses in the Poconos, with wonderful views of the Appalachian Mountains. Cherry Creek comes into play on both the front and back nines, making for carried shots on a variety of holes. Our golf course caters to golfers of all ages and abilities using a variety of tees can he enjoyed at all skill levels. 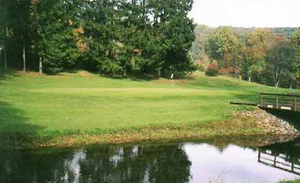 Scenic, challenging, friendly, and fun are the words best used to describe your experience at Cherry Valley Golf Course. Terrain: Hilly terrain. Well bunkered, water hazards on 8 holes. Turf: Greens: Bent Grass, Fairways: Blue Grass. Cart Fee: Included in Green Fee. Miscellaneous: This course was built on hilly terrain, so expect some uneven lies in the fairly narrow fairways. Several fairways are doglegs, and most are tree lined. The most difficult hole is #2.